Managed to squeeze in some hobby time last night and worked on the Leviathan a bit more. I wasn't totally happy with how the side sponsons lined up with the upper superstructure (or more precisely, how they didn't), so I added another layer of detail to the outside cut to better fit the angles as well as to give them a bit more pop - I'm also planning on adding some further brass etch to them, Aquilas on the ourside sponsons and an Opus Machina to the middle one. I also managed to dig up enough lascannons to fit on all the side turrets, and got those cut and mounted. As you may have noticed, I also added the awesome banner that LuckyNo.5 made for me. He was kind enough to set me up with a version designed to be double sided once it was printed out and wrapped around the banner pole. Turned out just right in my opinion! I printed it out on some thin cardstock capable of feeding through the printer, set to the highest print quality. After that I carefully cut it out and applied white glue to the inside - while it was drying I set the flag in a bit of a wavy pattern by careful bending around a few plastic tubes I had lying about. After it was set I sprayed it with gloss varnish, then again with matte varnish, which gave it a bit more protection and helped lock the bends in place. Easy peasy! I still need to do a mess of greenstuffing to take care of the gaps here and there, so for the moment the side sponsons are not yet fixed in place. I'm hoping to find some time to do that over the next week, though I'll admit that XCOM: Enemy Unknown has been getting a fair bit of my attention. Filthy Xenos! I've been following this without commenting up until now, but she really is looking a beaut, and I an't believe how quickly you've pulled it together! I seriously need to get back to working on my own Leviathan! @LuckyNo.5 - The banner is perfect, thanks again! Just been doing some catching up here, and wow - most impressive. In many ways actually - both the building project it self but also this huge killing machine thing. Are there rules for this beast in an Apoc game? Could it stand up to a titan? That turned out well - I was thinking it might have been a thick, uncnovincing imitation, but that works beautifuuly. And the idea of sealing it with varnish is such a simple step that I would never have considered. Thanks folks! I appreciate the kind words! @Todd Sherman - XCOM is fun for sure. It's also a huge time-sink! Beware! Heh. @Rogue Pom - The varnish also brings out a bit of the texture of the paper, which doesn't come through in the pictures but looks nice in person. Gives it a bit more of a cloth-like look. Holy Hell, that thing is awesome. I can't believe you have built this from scratch. Every post just seems to wow me more. My hat's off to you. 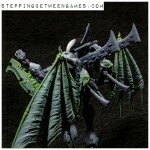 I can sculpt daemons and easy stuff like that, but clean lines and precision? No Way! Thanks very much OST! I have reciprocated envy of your GS skills - I wish I had half your talent in that medium!